Bicycle! Bicycle! : Might As Well Face It: You'll Accessorise the Bike. Might As Well Face It: You'll Accessorise the Bike. 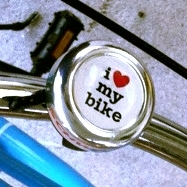 Of course, once you have bought your charmingly upright bicycle, you may suffer from the delusion that it is complete. It's not. Any bicycle shop sales person will undoubtedly convince you. Even if they don't, the law may require you to accessorise anyway with helmet, bell and lights so you might as well start Googling 'super cute head lights' and surrender to the madness. Looks fine until you try to attach it to the bicycle. Then it is too miniature! When I purchased the Pashley, I was so uncomfortable with the service I received at the point of sale that we actually drove straight to Ginger's favourite bike shop and 'completed' my bicycle there. For a start, the famous Pashley wicker basket the original shop presented me with was broken. I asked if they had a remedy and was pleased to be told they could swap it out. It was only after getting the Pashley home and looking over many pictures and web sites that I realised the basket they had given me did not look like the quintessential Pashley basket. It was significantly smaller compared to the bike than examples I had seen online. I wondered if it was because of export differences but I've seen many photos of North American Pashleys with large basket intact so I suppose I'll never know for certain. Worst of all, it did not actually bridge the distance between basket support and handlebars so it could not be attached to the bike. Long before I noticed the size discrepancy I noticed its fragility so part of my mission at Ginger's bike shop was basket replacement. I had also spent far too much time looking at pictures of honey coloured, luxurious Brooks leather grips on the internet so when I saw a green pair (The last pair of Brooks grips in the entire shop) I wondered if they'd look nice on the Pashley. They were offered to me at half price. I bought them. Rashly. For the Pashley. Yes, after careful consideration, I realised they were too chunky. I also realised that GREEN WHAT WERE YOU THINKING?! Now the grips wait patiently in a cupboard for a bicycle to call home while the Pashley continues to sport the black plastic originals. One day, Brown, Slim-line Brooks grips! One day! After my silly grips purchase, I even toyed with the idea of crocheting brown covers for the plain Pashley. Honestly, the less said about that - The better. Thankfully, Pashleys come with lights and bell so my insanity was curtailed on that occasion. 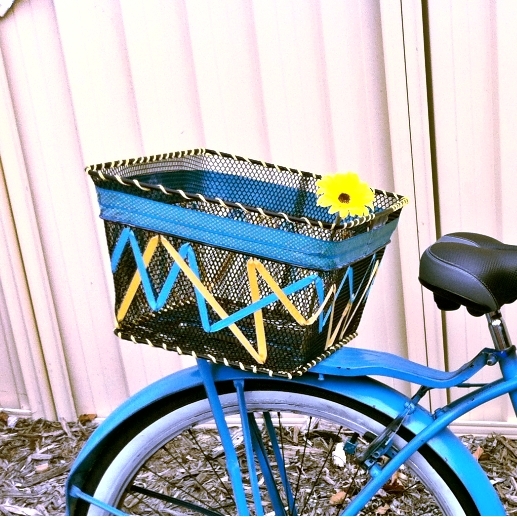 For the Schwinn Jenny I bought the cheapest, most standard wicker basket in the shop of bicycle purchase and have been looking for a larger and nicer one ever since. only by the search for the perfect lip balm. Knog Boomers front and rear. I also bought Knog lights which happened to be available in almost the same colour as the frame. Although if I had my time over, I would have bought the USB rechargeable versions rather than the battery powered. There's nothing wrong with the battery powered, I'm just not very good at remembering to keep batteries in the house. Of course, there are as many ways to spend money on your bike as there are outlets ready to sell you things and the bicycle world is full of $400 saddle bags that will make you ache for their leather-strapped beauty, but you can still add a personal touch to your bicycle without breaking the bank. You'd be surprised at the possibilities in your local K-Mart or craft supplies shop if you are quirky or love a spot of twee. Online shopping is great for finding bicycle accessories you didn't even know existed (Like many kinds of novelty valve-caps!) but there's also a lot to be said for exploring the ignored corner of your local bike shop. Even Roadie-centric retail will often stock a couple of items they begrudgingly included to appeal to the girlie crowd. I saw some mammoth Electra brand 'ding-dong' bells in one of my local shops despite the fact they don't stock Electra bikes. I may yet buy one. The largest range of upright bicycle accessories in Australian bike retail outlets would have to be Basil, the accessories offshoot of Royal Dutch Gazelle. 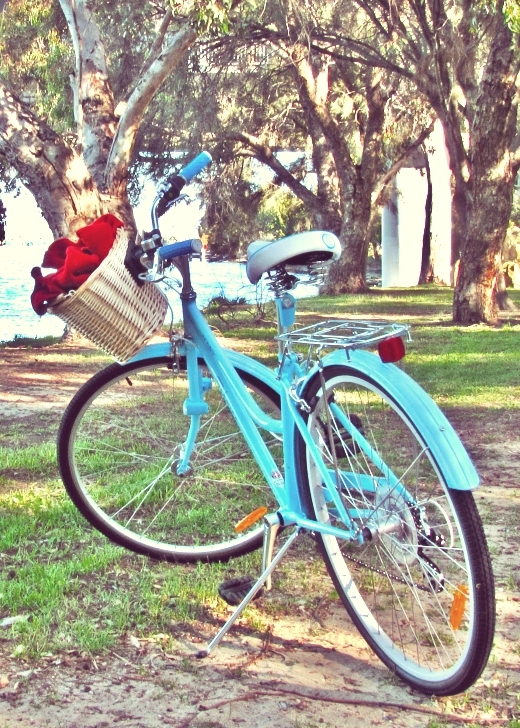 They make a huge range of bike bags, baskets, seat rain covers, garlands, pet carriers and other things people in transport biking countries take for granted. If your local bike shop is a stockist, you have been blessed. If not, try asking. The same goes for anything you've seen online. Sometimes you'll get a condescending look but other times you might discover that the proprietor has been wanting to stock more accessories but wasn't sure if there was a local market beyond the Roadie customers. (This has happened to me in a few places.) If nothing else, you're building a relationship with your LBS (Local Bike Shop) that will definitely benefit you both in the future. hour and one too many whiffs of super-glue. because it matched the red clips on my bungee strap.